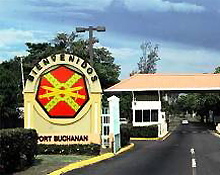 Fort Buchanan, the only active Army installation on Puerto Rico and in the Greater Antilles, was named after BG James A. Buchanan, the first commander of the Puerto Rican Regiment/1st U.S. Volunteers that was formed by Theodore Roosevelt during the Spanish-American War. Puerto Rico boasts fabulous ocean views, tropical weather, and lush green mountains. The island is approximately 100 miles by 35 miles and similar in size to Connecticut.